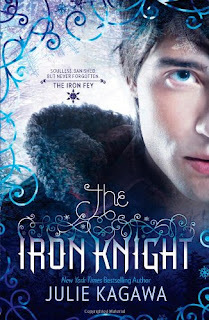 I am very excited to have Julie Kagawa, the New York Times bestselling author of The Iron Fey series, on the blog today. She's kind enough to answer a few questions about the latest installment in the series, The Iron Knight. It just came out October 25th, so be sure to pick up a copy! Was the Gauntlet as much fun to write about as it was to read? How did you come up with the different tasks that Ash would have to complete? Ah, this is where my gamer geekiness comes out. Almost every platform game or RPG has some sort of dungeon/castle/cave you have to get through, filled with traps and riddles and other nasty surprises. Would it be horribly nerdy to say I imagined Ash and company as a video game while writing The Gauntlet? It would? Oh well. Do you keep a glossary of characters so you don't get confused with all of the monsters and creatures of Nevernever? Is Puck going to get his own book? Are you going to do any spin offs of other characters now that Ash and Meghan are together? Any chance for a novella of Ash and Meghan's new life together in the Iron Kingdom? Thanks for visiting, Julie! I will keep my eye out for this new spin-off series; it sounds awesome! If you want to learn more about the Iron Fey series, check out Julie's website. You can also follow her blog here. Lastly, a big thank you to Harlequin and Media Muscle for allowing me to be a part of this blog tour. I still need to read the third and forth book. I really enjoyed the first two books. Great post! I love Julie! Her personality shines through in her answers and it's always fun to read her interviews:) I'm really looking forward to read Ethan's story, and of course, cameos by the original characters are a major bonus:) Thanks so much for this interview! Mrs Q- Thanks for visiting! I hope you get to read them soon. Jenny- I know, right! :) Thanks for checking it out! I appreciate it. So excited for the spin-off series! Also I love that Julie is a gamer! That makes her even more amazing than she already was.